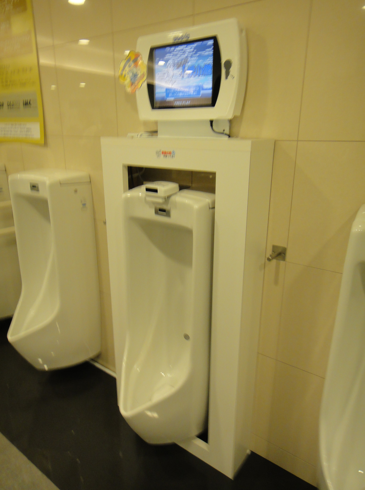 Do you remember the Toylet, the bizarre video game system from Sega that can be placed inside urinals and allows you to control on-screen action with your pee? The Toylet’s core elements are an LCD screen (placed above the urinal) and a speed sensor to track the “pressure level” of your stream. First, an infrared sensor detects when a person approaches, and changes the screen to the game ready display. Next, microwaves hit the stream of urine when the person urinates, and it reads the reflected microwaves to detect the speed of the urine stream. The volume is then calculated by the speed and duration of the urination. Diginfonews in Tokyo shot this video of the latest version, and they also squeezed out sales information out of Sega: it looks like big S will start shipping the Toylet in Japan in November for $1,850 (for both hardware and software).